Watch this video created by Josephine Yee to see the Soundwaves program in action. Soundwaves is a Marin City program that allows Kindergarten through 8th Graders at Bayside/Martin Luther King Jr. Academy to experience the joy and study of music. In the past year, over a dozen Redwood music students have participated in the program, mentoring and inspiring the budding young musicians while offering free lessons. Today, Soundwaves runs from 9 am to 1 pm every Saturday when the teen volunteers teach drums, guitar, saxophone, clarinet, trumpet, flute, and piano. Working with former Bayside/Martin Luther King Jr. Academy principal Jonnette Newton, the program was created by 2017 Redwood graduate Noa Zimmerman. 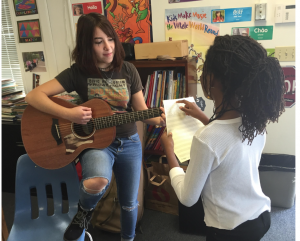 Interest in the program quickly spread throughout Redwood’s music department. Senior Jane Burke has recently taken the reins to head-up the program. She and Redwood’s other helpful students will continue to create a nurturing community of role models who share a passion for music. Based on the success of the program, Soundwaves is now under the umbrella of the Center for Excellence, a non-profit that supports the arts. In addition, Music Chest provided a generous $5,000 grant. These and other funds, including a scholarship that Zimmerman is currently developing, will go toward renting instruments for the students, many of whom do not have the resources for instruments or private lessons. This year, a $1,000 scholarship was awarded to an MLK middle school student, which will be used for individual lessons with a professional music teacher.